The Westinghouse WGen2000 has been engineered with homeowners in mind. A combination of great features, fantastic engineering and an affordable price point. Westinghouse consistently delivers great value to customers, which is why we love to promote their products. We’ve featured the Westinghouse WGen2000 in articles discussing the best generators, but it’s time to devote an article that features this incredible generator as the primary focus. The Westinghouse WGen2000 is a remarkable generator with a peak wattage of 2500W and a constant running wattage of 2000W. When you compare the Westinghouse WGen2000 to others that cost about the same (or even more), the Westinghouse displays a level of quality and features that make it incredible value for money. This article takes the form of a detailed review of the Westinghouse WGen2000. The Westinghouse name isn’t that well known as a manufacturer of portable generators but they have been industry leaders in the power generation and electronics industry since the very beginning of electric power in the US. In fact, the Westinghouse Electric Company has been a serious influence on the electronics industry, not just in the US, but worldwide. Along with a detailed review of the Westinghouse WGen2000, we’ll also be reviewing the Yamaha EF2800i. This is not a comparative review. In order for that to be possible, they need to be comparable generators. They are, however, very different machines. The Yamaha EF2800i is a quiet inverter generator, this makes it a lot more expensive than the Westinghouse WGen2000. So you can look at this rather as a reasonable alternative if you’re looking for an inverter generator. If the price of the Yamaha scares you, the Westinghouse WGen2000 is going to come as a very pleasant surprise. That is if you’re not specifically looking for an inverter generator. The Westinghouse WGen2000 is made to a quality standard that can truly match that of the most expensive brands like Yamaha and Honda. You’ll just be paying a lot less for the Westinghouse. Dependable power on demand. Excellent generator for the money. I’m going to start with a small side opinion that doesn’t reflect much on the generator itself, but rather the integrity of the brand. You’ve probably noticed that most generators use their peak wattage as the part of the model number. This would mean that, if Westinghouse used this method, this model would be the WGen2500 (the peak wattage is 2500W). Instead, they opted for modest branding, using the running wattage. This really isn’t a big deal, when it comes down to it, but rather gives one a reassuring sense that these guys aren’t trying to over-sell their product. When it comes down to it, you’re running wattage is what you’re really looking at. The peak wattage is just a short burst of power to allow for high-current startup appliances like refrigerators that use an induction motor and need a capacitor to step up the wattage when the motor starts. Frame made from generous amounts of high quality steel. What can run on the Westinghouse WGen2000? Your actual running power determines what you can use continuously and that’s where it really counts. Having the constant power of 2000W is slightly limiting but the proportionally higher peak wattage of 2500W does help. Let’s look at how this is going to work in practice. Because of its size and power output, the Westinghouse WGen2000 is more likely to be used for RV camping trips and light-duty site work by contractors. That being said, it can be used as a backup generator for your home – if you’re prepared to make some compromises. I wouldn’t suggest connecting the Westinghouse WGen2000 to your house wiring through a transfer switch. It just doesn’t provide the wattage to warrant this. You’re better off using a generator with at least 5KW continuous power for this, even larger would be better. If a big generator is out of your league, the Westinghouse WGen2000 can still be a lifesaver when you need it to keep some basic appliances running during a power outage. Here’s a list of some essentials that you can consider and their estimated running and peak watts. When you look at this list, you’ll immediately see why I say that you’ll need to make some compromises. While the running watts are well within the capacity of the Westinghouse WGen2000 (you could even use a lot more), the problem comes in when your refrigerator starts. Because the refrigerator uses a thermostat, it can start randomly at any time. This means that if your refrigerator starts when some others appliances are running or starting at the same time, your generator will trip. Remember that this list is indicative and the rated wattage of the appliances may vary. You could also exchange the refrigerator for other appliances that use a similar running and starting watts (a microwave or room air conditioner). The only thing to remember when using a generator of this size is that you may have to switch off some appliances when using others. This can be a bit inconvenient, but at least you’ll have the electricity that you need in an emergency. If you use an Energy Star refrigerator with a high energy efficiency rating, you won’t have any of these problems and it’s likely that you could run more than one refrigeration appliance, like your deep freeze as well. This is if both your refrigerator and deep freeze have a good Energy Star rating. Because the Westinghouse WGen2000 doesn’t make use of an inverter, it could harm sensitive electronic equipment, especially when running at high loads. If you’re going to be using the generator to supply power to computers and TVs, I’d suggest using an Uninterruptible Power Supply (UPS). By plugging these items into a UPS, the internal inverter inside the UPS will deliver the pure (low HD) sine wave needed. You can then plug the UPS into an extension cord connected to the generator. So this gives you a basic idea of how you can use the Westinghouse WGen2000, let’s take a deeper look at the generator itself and why we think this is such a fantastic machine. One of the things that I rate so highly when it comes to all Westinghouse generators is the emphasis that they place on durability. Form the very first impression, the tough durable frame already says a lot about how serious they are about build quality. All generators that use this type of traditional design, make use of a tubing frame to mount the generator and protect it from knocks and bumps, but the 1-inch steel frame on WGen2000 is noticeably tougher than most. The higher weight of 97-pounds indicates that this machine has thicker and tougher steel components than lighter machines. This does mean that it takes some strength to carry the Westinghouse WGen2000 and it doesn’t have any wheels to make this easier. You’ll also notice that the thick tubing frame runs over the top of the generator so the gas tank is also protected. Read the manual thoroughly before operating. Having a tough frame is all good and well but the engine and alternator are where robust build and design really counts. In this regard, the Westinghouse WGen2000 really makes the grade. The 212cc, OHV, four-stroke engine has cast iron sleeves and is as tough as the best of them. It starts using a recoil starter and this is as easy as pie. Just one pull and the engine is purring at its rated 3600 RPM without a splutter. This engine is also CARB, EPA and CSA compliant. So the Westinghouse is not only certified for use in all 50 states but Canada as well. The engine uses standard SAE 10W-30 engine oil, you get a bottle of oil and a funnel with the generator to get you started. This bottle of free oil is measured to the exact amount that the engine uses, 0.6L (20.3 OZ). If you intend doing your own oil changes, keep the bottle – this will help you measure out your oil precisely without any effort. It has a low oil shutoff to protect the engine if the oil level drops too low. You also get a basic tool kit and handle with the WGen2000. Even though the Westinghouse WGen2000 doesn’t have a fuel-saving eco throttle, it’s remarkably light on fuel. The generator has a 4-gallon gas tank and this will give you an incredible 20-hours of run time at 50% load. That works out at 5-kilowatt-hours per gallon of gas. This is far better than most generators that have an economy smart throttle. It uses regular unleaded fuel. Unfortunately, I can’t get official noise levels for the Westinghouse WGen2000. I can say that it’s not as noisy as most open frame generators and there are countless customer reviews confirming that the Westinghouse WGen2000 is quieter than most in its class. The WGen2000 uses a four-point rubber mounting system which serves to reduce vibration levels. This also helps reduce the noise and prolongs the life of the generator. What’s the Westinghouse WGen2000 like to use? I’ve already mentioned that the Westinghouse WGen2000 is a breeze to get started. Even though you don’t have the luxury of an electric starter, no one should have a problem getting the engine running. Once the engine is running, it’s a simple matter of plugging in your extension cord (or cords) and switching the main breaker on. The main circuit breaker provides overload protection up to the maximum peak watts of 2500W (20.8A). It has two Duplex 5-20R household 120V power outlets. This gives you a total of four outlets using a standard household extension cord. Because of the power output, there are no outlets for RV or transfer switch connections. This generator doesn’t produce the wattage to warrant these plugs. I like that all the electric outlets have rubber covers that are just as tough and durable as the rest of the machine. These covers protect the outlets from dust and moisture, further prolonging the life of the generator. There are no gauges and complicated switches on this generator, just the basics. This makes the Westinghouse WGen2000 very simple and easy to use. On a generator of this size, voltmeters and ammeters aren’t that important, because you won’t be running heavy equipment off it. The most power that you’ll use will probably be a refrigerator or air conditioner and if you overload the generator, it’s going to trip the main circuit breaker. Simple control panel. Turn it on and plug devices in. Easy! Conclusion : How Good is the Westinghouse WGen2000 Generator? 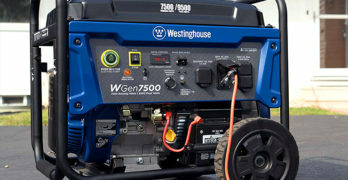 For a basic 2000W generator to provide power for an RV or job site as well as backing up the essentials in your home, the Westinghouse WGen2000 is one of your best options. It’s one of the toughest generators that you’ll find and is exceptionally cheap for what you’re getting. Westinghouse offers a 3-year limited warranty on the WGen2000 and you have the service backup from a company that’s been an industry leader for well over a century. All of this makes the Westinghouse WGen2000 the bargain of the year, in my humble opinion. Visit the Westinghouse site to learn more about their lineup of generators. It’s very easy for us to recommend Westinghouse generators because they give consumers exactly what they want — high-quality generators that are both reliable and affordable. Westinghouse has a wide range of portable generators to match your needs. The one constant from Westinghouse is the value you get back for the money you put forward and because of that fact, we’re happy to recommend their products. Not a fair comparison. This Yamaha model is in a league of its own — 2800 Starting watts / 2500 Running Watts. Ultra-quiet. One of the quietest generators in its class (64-68 dBA). ✓ View or download the MANUAL or the SPEC SHEET for the Yamaha EF2800i. The Yamaha EF2800i is not just more expensive than the Westinghouse WGen2000, it’s one of the most expensive inverter generators in this wattage range. Then again, it’s a Yamaha and this is one of the most respected names when it comes to quality high-end generators. Yamaha engines are famous for being both reliable and durable. In addition to this, Yamaha has done more research and development into electronics than most other generator manufacturers. Because an inverter generator relies on electronics for much of its functioning, this gives Yamaha an advantage over most other inverter generators. While on this topic, Westinghouse also manufactures inverter generators. The Westinghouse iGen range of inverter generators compare well to this one. The Westinghouse company is just as accomplished as Yamaha when it comes to electronic research and development – probably more so. A high-end model built to last from Yamaha. Now it’s time to focus on the Yamaha EF2800i and why it’s one of the best sellers among the higher priced inverter generators. This review is going to cover the Yamaha EF2800i in a general sense. For a complete review of this generator, you should take a look at this full review of the Yamaha EF2800i. Apart from the benefits of inverter technology and quieter operation, one of the first notable differences between the Yamaha EF2800i and the Westinghouse WGen2000 is a higher power output. The Yamaha EF2800i delivers 2500 watts of running power and 2800 peak (surge) watts. If we look at the list of appliances in the above section, you’ll see that the peak wattage of the Yamaha comes very close to the maximum starting wattage required for all the appliances listed. This slight increase in output wattage means there will be less need to switch off some appliances and equipment when using others. Though the biggest advantage has to be the inverter, this is also the biggest contributing factor to the higher price of the Yamaha EF2800i. A lot has been said about inverter technology in other articles, so I’ll summarize these here. An inverter provides a pure sine wave with low Harmonic Distortion (HD). A lot of electric equipment that we use in our everyday lives make use of electronic components that are harmed by repeated exposure to high levels of HD. Among these, the most important will probably be computers, TVs, and stereos. Although these products use sophisticated electronics, many other appliances use some basic electronic controls, these could include microwaves, dishwashers and AC units. It’s recommended that electronic equipment is used with a power source with no higher than 3% Total Harmonic Distortion (THD). The Yamaha EF2800i is one of the best in this regard, producing less than 2.5% THD. Another advantage to using an inverter generator is the smart throttle (or eco-throttle) that adjusts the engine RPM to the load placed on the generator. This means that the generator will use less fuel at lower wattage and the engine also experiences less wear and tear – reducing your long-term maintenance costs. The smart throttle used on the Yamaha EF2800i gives it one of the best fuel consumption stats for a portable generator. So despite having a small 2.6-gallon gas tank, the Yamaha EF2800i will give you around 14.7-hours from a single tank at 25% load. This works out to 3.53 Kilowatt hours per gallon of gas. While this might be a pretty impressive runtime from a generator of this size, it pales in comparison to the remarkable 5 KW/H per gallon that you get from the Westinghouse WGen2000 that doesn’t even have a smart throttle. The Yamaha also has a smaller 171cc, four-stroke, OHV engine. The Yamaha engine is as durable as they come and has similar cast iron sleeves to the Westinghouse WGen2000 engine. Where the Yamaha EF2800i displays a great level of superiority is in its superbly quiet operation (64-68dBA). This means that even at its loudest, the Yamaha is barely louder than the average conversational voice. The Yamaha EF2800i is also one of the lightest in its class at only 68 LBS. I wouldn’t say that the lightness of this generator is any indication that it’s less durable than others that use heavier steel components. It seems like Yamaha has chosen to use lightweight (and more expensive) materials like aluminum in its construction. If anything, this should make the Yamaha more durable than most. The comprehensive control panel on the Yamaha provides you with everything you’d want. It has two household 120V outlets and a large 120V RV outlet – both protected by thermal overload circuit breakers. It has warning lights for everything, like when it shuts down as a result of low oil or when the power circuits have been overloaded. It also has a 12V battery charging outlet which is very handy. Like most generators of this size, the Yamaha EF2800i makes use of a recoil starter and there’s a switch on the control panel for selecting the smart throttle for running it in economy mode. The Yamaha EF2800i is one of the most highly rated inverter generators in its class and for good reason. Yamaha engineering is of the best in the world and they have a solid reputation for building high-quality products. To this end, you get a 3-year warranty on the Yamaha EF2800i.